Here is a belated trip report.� It doesn't describe current conditions, since they've changed a lot since Saturday.� But it describes a really enjoyable tour, one that is especially good now that the Crystal Mountain ski area has closed for the season.� It's a link-up of four summits above Crystal, a loop I call the Crystal Quartet. Threeway Peak - I left the base lodge a little after 8 a.m. Saturday, hoping to hit some north facing slopes before the day warmed up too much.� The morning was nice and cool, but the freezing level was forecast to climb a lot during the day.� I skinned up Quicksilver and back into Silver Basin, then climbed to the saddle east of Threeway Peak.�I skied up the east ridge of the peak then scrambled on foot the last few feet to the summit.� On the descent I poked and tested the snow a bit then skied down the NE gullies to Silver Basin, finding wind affected powder. Silver King - Putting skins on again, I climbed toward Silver Saddle, passing a group of climbers descending on foot.� They were apparently a class, since they were roped up on terrain that didn't require it.� I skinned to the top of Silver King and looked down the north side.� The broad gully to skier's right of the summit looked the least wind affected, so I descended that way.� I poked and tested the top of the gully, then enjoyed a long set of turns down the fall-line into Avalanche Basin. Then I traversed through the woods to the base of the High Campbell chairlift. Silver Queen - Skins on again.� As I was climbing Campbell Basin toward Silver Queen I met two old friends who were descending, concerned about the sun-warmed slopes above.� I think one member of the party was less comfortable with the conditions than the other, and the other had honored those concerns and had turned back.� That's the way a partner should behave!� I judged the conditions to be okay and continued to the top of Silver Queen.� Descending Powder Bowl, my skis occasionally bottomed out on icy moguls. This was the poorest skiing I encountered on any of the peaks. Summit Lodge (REX) - I skied to the bottom of Little Portillo, then skinned to the lodge at the top of the Rainier Express chairlift.� I ran into another couple of friends here.� We chatted and enjoyed the view then one of them joined me to ski upper Green Valley.� I said goodbye and descended Iceberg Gulch, finding good corn snow on the left side.� Sticky snow on Lower Bull Run (Lower Ferks) returned me to the base lodge. I really enjoyed the combination of cross-country travel and downhill skiing on this tour.� Although I might have found better snow by yo-yoing some of the slopes along the way, it was satisfying to keep moving and never retrace my tracks.�It's great finding new ways to enjoy old haunts like Crystal Mountain. 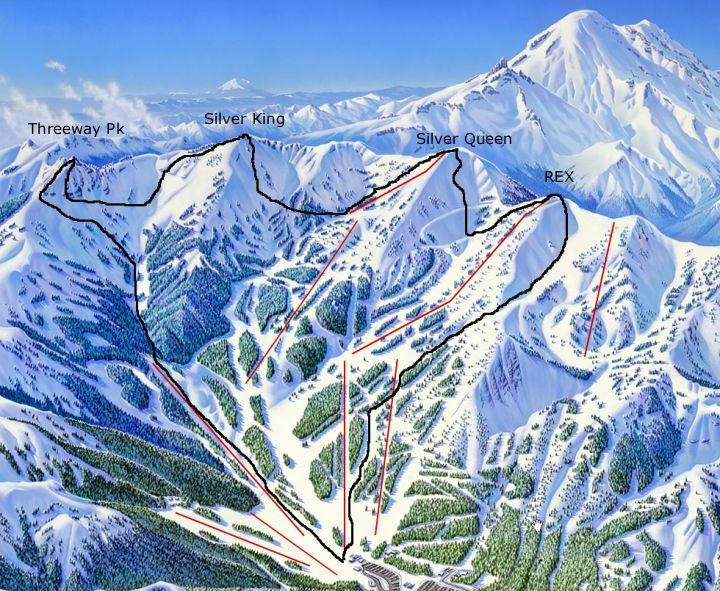 Thanks for the report Lowell.� I hadn't thought of that trip, but what a nice tour with lots of options (ascents of the Throne, Snorting Elk, and Northway Peak all beaconing too).� Especially good now with the great snow coverage and on� a sketchy weekend for avy conditions. There's a nice aesthetic bonus when you get to the summit lodge after skiing the other three peaks. In the foreground you see Silver Queen, then behind it and a little to the left is Silver King, and behind and a little to the left again is Threeway Peak. The north sides were untracked when I skied them Saturday morning, so it was nice to look back at the three descent tracks, all in a row. I can't think of another tour quite like that, off the top of my head. Saw your tracks on Sun. As soon as the sun hit Silver Basin the top 6" of snow started pinwheeling. Skiiers set off sluffs 6" down to the last wet crust. Heavy skiing. S face is melting off fast but only has 3" snow over the wet/icy crust. BTW Lowell you weren't kidding about your "billygoat" skintrack on Threeway. I used your track to the left gap later that morning but didn't think I had the skinning skilz to get up that little bulge; that thing was steep with some airy kickturn spots! Wolfs, was that you in the parking lot when I left in the morning? If so, nice to meet you. We'll have to actually introduce ourselves if we bump into each other like that again. I did that tour this year - with a detour into Crystal Lake Basin - had a great time. Some photos here: http://www.flickr.com/photos/87385602@N00/page3/ - Wish I'd known about this forum sooner or I'd have toured more when I was in Washington. "I climbed toward Silver Saddle, passing a group of climbers descending on foot. They were apparently a class, since they were roped up on terrain that didn't require it. " Today is the first I have checked TAY in a bit and I found your post. The group of climbers descending was indeed a class. I am teaching a bunch of boy scouts basic mountaineering techniques and doing physical training for a planned climb of Mt. Rainier in July. We all admired your tracks coming off Three Way and I kept waiting for you to descend into Silver Basin from The King. Nice to hear the rest of your tour. If was a fantastic morning to be in the mountains.